Tis the season to dress in holiday colours? Most of my dolls wear dresses, only occasionally pants, and even when they wear dresses the outfits end at or above the knee. Hardly appropriate for the type of temperatures that we’ve been having here, and yet if someone issued me the challenge to dress all of my dolls in holiday and weather-appropriate garments I would fail that challenge (miserably so). I focused a lot this year on expanding the shoe collection – mostly because doll shoes are darling and I like all things teeny tiny. But then that means that one part of the wardrobe expanded, and I did add a couple dolls, but there wasn’t any addition of winter wear. This is most unfortunate as, even though it hasn’t snowed yet here, it is very cold and I feel colder just looking at my dolls in their weather-inappropriate-clothing. Or maybe I just need to turn up the heat a wee bit – either way, it’s cold and that must mean that the dolls are cold too! Just because we have limited amounts of winter garb here, doesn’t mean that I wasn’t able to pull together a winter outfit ! It’s a good mix of handmade and commercially-available items. Sophie declined to model, something about it not being “designer”… What are some of your favourite wintery clothes? 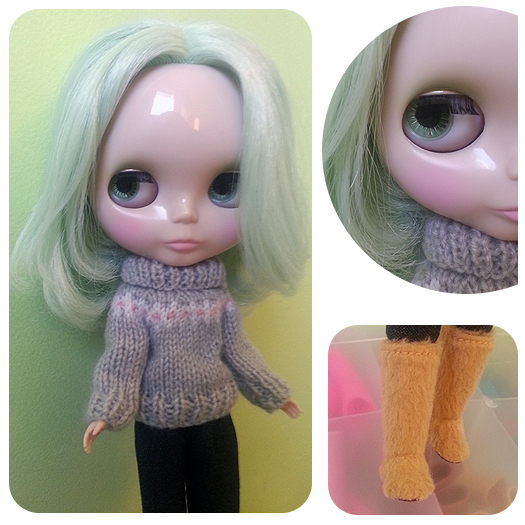 Of course, now my dolls have a new request – skinny jeans that can fit into boots!